Would your son like a superhero at his birthday? Maybe your daughter wants a fairy? Well, now you can have the character of your choice to take the birthday kid and their friends on a fairytale adventure. 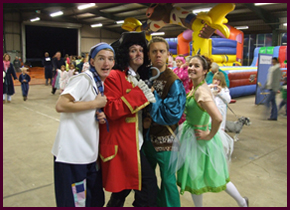 Our professional actors will make this a special and memorable day with games and activities to keep everyone involved. But what’s so special? It’s all incorporated within a story, so the children become part of the adventure. The story is individually written and rehearsed for every event, so each party is unique. Whether your child wants a cowboy themed party or a Disney themed party, our actors compose a structured story dependent on your child’s chosen character, including lots of music, games and fun. Also available is our standard Star Party, which is a modern, fun and cool version of a clown and includes the same activities and games as the themed parties. We can also help you find a venue, organise a cake, party bags, or anything else you can think of that will make your child’s party the best ever!